This week’s pairing brings us into teas. Two Leaves and a Bud’s tea, organic Assam breakfast, should be an easy pickup from the local grocery store. It’s a strong black tea with a full, malty flavor and slightly smokey aroma. If you’re new to teas, the tannins — responsible for its bitterness and astringency — might be a little overpowering, but it’ll cut really well with some milk and honey to soften the flavor. The pairing should feel bold, but carry out a pleasantly surprising smoothness that demonstrates our protagonists’ ability to adapt to sticky situations. Whether the protagonists forcibly insert themselves into the thick of things or they’re thrown into it, they handle smokey backstreets and dark alleys with steady hands and steadfast determination. 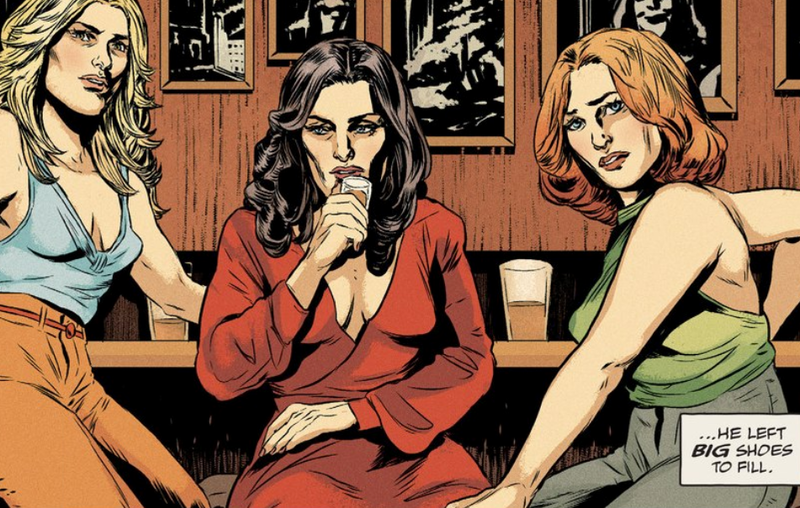 The Kitchen, written by Ollie Masters with art by Ming Doyle is a pretty new series, only in its third installation and set in the Hell’s Kitchen district of New York in the 70s. The drama follows Kath, Raven and Angie, three wives of high-ranking mob members who have to take over and protect the family business. The story’s written in a dynamic, realistic setting that makes the characters feel much more full without as much exposition. There’s a sense of tension in the air that needs to be broken, and it makes it even easier to follow the women as they seek to do so. Similarly, Dead Letters, written by Christopher Sebela with art by Chris Visions, is also pretty new. Sam wakes up in a dingy motel room and remembers nothing about who he is or why he’s there. Sam has to adapt to his situation, and fast. He’s being chased for reasons that he doesn’t yet know, but lucky for him Sam appears to be a natural when it comes to handling peril. He’ll start out like Jason Borne — with a supernatural twist. Both works from this week show strong characters jumping headfirst into crime and danger like they were born for it. Frankly, they’re bold, bitter and ready to stand behind a smoking gun if they have to, which makes them pair with organic Assam breakfast tea all the better.